The epithelial-mesenchymal transition (EMT) has a significant role in embryogenesis. EMT is also implicated as a fundamental step development of invasive phenotypes associated with progression of cancer. EMT confers the cancer cells with migratory and invasive properties that allow them to come into the stroma, which creates a conducive environment for cancer progression and metastasis. Moreover, acquisition of EMT is linked with resistance to chemotherapy that could lead to recurrences and enhance the morbidity and mortality related to cancers. Consequently, EMT has been associated with carcinogenesis, invasion, metastasis, recurrence, and chemoresistance. 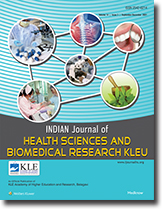 Research into EMT and its role in cancer pathogenesis has advanced in a rapid pace, but since its participation shows considerable variation among different cancer types and the exact mechanism operative in different cancers remains ambiguous; EMT continues to be a significant issue for research. In this review, we present an overview of EMT, its role in cancer progression and the clinical implication of its identification. Cancer is exemplified as a disease that is characterized by unhindered proliferation of cells. The enormous bulk of human malignancies are carcinomas, and the incidence of metastases owing to tumor progression is the reason attributed to the majority of cancer-associated mortality. , Since, cancer development is a multistep process characterized by the accumulation of genetic defects and mutations reflected by changes evident at the molecular level, the mechanisms involved in the development of cancer and subsequent metastases are crucial questions in comprehending cancer. Understanding of this process will aid in the detection of novel therapeutic strategies in the management of cancers and for designing future therapies. , This highlights the requirement to recognize molecular conduits that could give a added accuracy and reliability to predict disease aggressiveness and clinical course. Epithelial-mesenchymal transition (EMT) is one such multifaceted molecular program in malignant transformation which causes loss of epithelial characteristics and gain in mesenchymal phenotype. EMT is believed to be a vital mechanism for carcinoma progression and is associated with aggressive behavior of cancer cells. , EMT is involved in morphogenesis during embryonic development, is attracting increasing attention as an important mechanism for the initial step of metastasis. Here, we present an overview of EMT, its role in cancer progression and the clinical implication of its identification. The process of EMT can be described into several steps, some of which may overlap and occur concurrently. A change in expression of E-cadherin is the typical epithelial marker for EMT. Its expression is reduced during EMT in embryonic development, tissue fibrosis, and cancer. Cadherin switch from E-cadherin to N-cadherin which is expressed in mesenchymal cells, fibroblasts, cancer cells and neural tissue has been used as a marker for EMT. EMT has also been associated with relocation of cells from the basement membrane microenvironment into the fibrillar ECM, which is reflected by the change in the level of expression of different integrins (integrin switch). Fibroblast-specific protein-1 (FSP-1) is a member of the family of calcium binding S-100 protiens and is a marker for detection of EMT in cancer and fibrosis. In tissue fibrosis, FSP-1 expression is demonstrable early in the transition to fibroblast as reported in kidney and liver fibrosis. , In cancer, ectopic expression of FSP-1 facilitates EMT-Type 3 in cancer cells. Vimentin is an intermediate filament protein expressed in various cells including fibroblasts, endothelial cells, cells of hemopioetic lineage and glial cells. This marker is often used to identify cells undergoing Type 3 EMT in cancer-based on the positive correlation of vimentin expression with increased invasiveness and metastases. Fibronectin is has been used as an indicator of Type 1 EMT associated with gastrulation, palate fusion, and neural crest migration. In addition, both Type 2 and Type 3 EMT are associated with increased fibronectin expression. 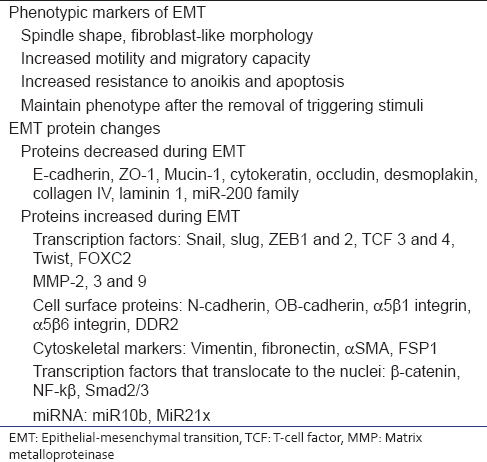 The basement membrane constituents such as Type 4 collagen, laminin, and nidogen are downregulated during EMT suggestive of the invasive and migratory capacity of cells undergoing EMT. Fibroblast transcription site-1 is a cis-acting regulatory element present in the various EMT-associated genes that encode key players such as FSP-1, twist, snail-1, E-cadherin, β-catenin, vimentin, and α-SMA. Snail transcription factors are a prominent example of a common downstream target of various signaling pathways that regulate EMT. All known EMT events during development, fibrosis, and cancer appear to be associated with Snail activation. Twist is a basic helix loop-helix protein that is transcriptionally active during lineage determination and cell differentiation. It is up-regulated in all three types of EMT. EMT is a highly complex process requiring extensive changes in adhesion, cell shape and gene expression. Therefore, its regulation is also multifaceted and various mechanisms have been identified leading to specific gene repression and activation, transduction signaling pathways, and a numerous mediator molecules conspire in controlling EMT. There is extensive cross-talking between numerous pathways leading to complex biochemical circuits. The key molecular change involved in EMT is down-regulation of E-cadherin that represents the critical step of reduction in cell-cell adhesion leading to disruption of epithelial architecture and is thus regarded as the "master regulator" of EMT phenotype switch. Transforming growth factor-beta (TGF-β) is the most potent and best-characterized inducer of all three types of EMT. 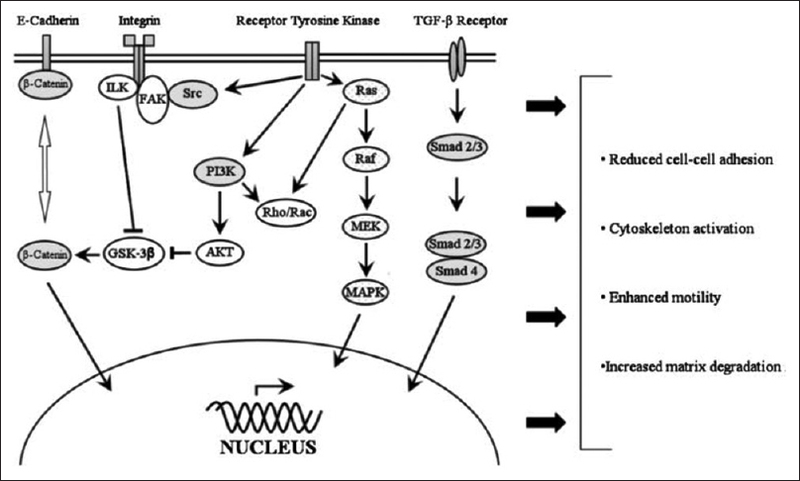 TGF-β signaling pathway is mediated by Type 1 and 2 transmembrane serine - theonine kinase receptors, which on phosphorylation, can act either by Smad-dependent or Smad-independent pathways. TGF-β on binding activates Smad 2 and 3 that bind to Smad 4 which translocates to the nucleus to activate lymphoid enhancer-binding factor 1/T-cell factor transcription factor which release β-catenin and Smad leading to EMT. TFG-β also regulates E-cadherin expression by activation of Snail and slug through Smad signaling. It increases the expression of ZEB1 and SIP1 that promote repression of E-cadherin. In addition, TGF-β associated Smad complexes are known to increase N-cadherin, fibronectin and α-SMA expression. TGFβ can activate Ras/MAPK, p13 K/Akt, Rho/Rac and integrin-linked kinase (ILK), and Wnt/β-catenin pathways for induction of EMT. Beta-catenin binds to E-cadherin and also transduces to the nucleus and is involved in transcription via the Wnt signaling pathway. In absence of Wnt signal, β-catenin is associated with E-cadherin at the adherens junction and nonsequestered cytoplasmic β-catenin is rapidly phosphorylated by GSK3β in APC/GSK3β/Axin complex leading to its subsequent degradation by the ubiquitin-proteosome pathway. Wnt glycoprotein binds to frizzled receptor and inhibits GSK-3β degradation of β-catenin leading to its cytoplasmic accumulation. This may translocate to the nucleus and bind to LCF/TEF receptor leading to transcription of down-stream effector genes including Ets, jun, fos, slug, fibronectin, and vimentin for the development of EMT phenotype. Following invasion, EMT comes into play along with increased angiogenesis that facilitates development of metastatic phenotype. EMT enables the tumor cells to intravasate into the blood vessels and gain entry into the and also aids the tumor cells to egress from the blood stream to deposit themselves in a distant location where they can form secondary deposits (micro- and macrometastases). The metastatic deposits are formed by the reverse process, i.e. MET which requires that the cells revert back to the epithelial characteristics to adhere and colonize to form new tumors. EMT and cancer progression is a potential field of cancer research. Despite the abundance of evidence for EMT in embryonic development, in vitro, and in model systems, solid evidence of EMT in clinical carcinoma are still sparse, thus making it an important issue in this field. 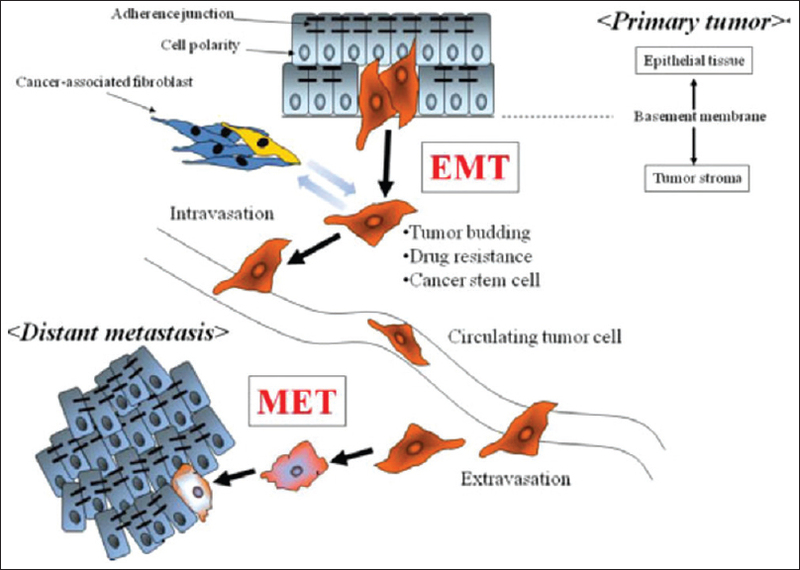 The role of EMT in tumor progression and metastasis provides a fascinating mechanism to explain the initial step of metastasis. However, several areas require additional exploration to expansively appreciate the role of EMT in physiological and pathological processes. Innovative breakthrough will clarify the complex role of EMT and may yield promising information to develop novel therapeutic approaches in the management of cancer. Ingber DE. Cancer as a disease of epithelial-mesenchymal interactions and extracellular matrix regulation. Differentiation 2002;70:547-60. Iwatsuki M, Mimori K, Yokobori T, Ishi H, Beppu T, Nakamori S, et al. Epithelial-mesenchymal transition in cancer development and its clinical significance. Cancer Sci 2010;101:293-9. Kalluri R, Weinberg RA. 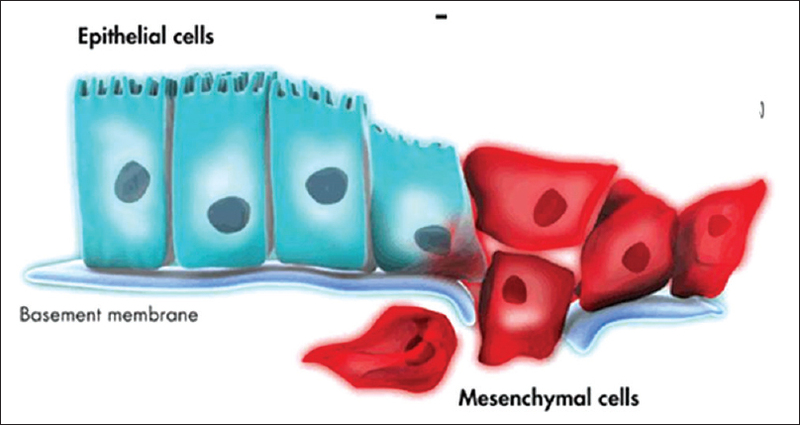 The basics of epithelial-mesenchymal transition. J Clin Invest 2009;119:1420-8. Lee K, Nelson CM. New insights into the regulation of epithelial-mesenchymal transition and tissue fibrosis. Int Rev Cell Mol Biol 2012;294:171-221. Lee JM, Dedhar S, Kalluri R, Thompson EW. The epithelial-mesenchymal transition: New insights in signaling, development, and disease. J Cell Biol 2006;172:973-81. Turley EA, Veiseh M, Radisky DC, Bissell MJ. Mechanisms of disease: Epithelial-mesenchymal transition - does cellular plasticity fuel neoplastic progression? Nat Clin Pract Oncol 2008;5:280-90. Zeisberg M, Neilson EG. Biomarkers for epithelial-mesenchymal transitions. J Clin Invest 2009;119:1429-37. Guarino M, Rubino B, Ballabio G. The role of epithelial-mesenchymal transition in cancer pathology. Pathology 2007;39:305-18. Acloque H, Adams MS, Fishwick K, Bronner-Fraser M, Nieto MA. Epithelial - Mmesenchymal transitions: The importance of changing cell state in development and disease. J Clin Invest 2009;119:1438-49. Thiery JP. Epithelial-mesenchymal transitions in tumour progression. Nat Rev Cancer 2002;2:442-54. Jing Y, Han Z, Zhang S, Liu Y, Wei L. Epithelial-Mesenchymal Transition in tumor microenvironment. Cell Biosci 2011;1:29. Steinestel K, Eder S, Schrader AJ, Steinestel J. 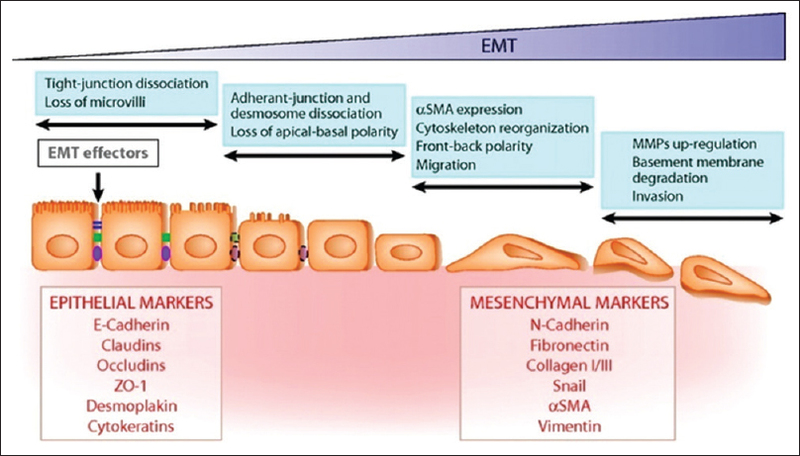 Clinical significance of epithelial-mesenchymal transition. Clin Transl Med 2014;3:17.